If you're looking for ideas to increase your dispensing rate for littleSTEPS® and/or QUADRASTEPS®, take a look at our Clinic Solutions Pack. 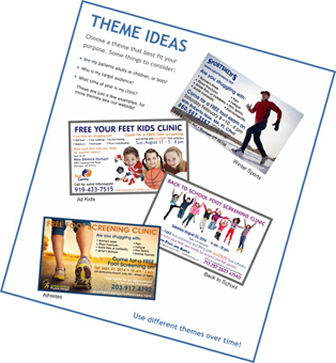 You will find Guidelines, sample mailers, posters, and more to help you put together a well planned and executed Clinic program. If you just started dispensing littleSTEPS® and/or QUADRASTEPS®, you can use clinics as a way to kick off your prefab program. You can also use clinics over time to serve and expand your patient base. We want to help you have the most successful sales program possible, and we can help you with planning and execution, as well as creating customized promotional materials for you, all at no charge! We can also provide graphics you can include on your web site.